I got up very early—too early—because I knew that what I wanted to do was to drive to far eastern Ohio, then head north, sort of paralleling the Ohio river but inland. I knew there would be some interesting Appalachian country in that region that I had never explored before. Even the cows had that “what is this guy doing up so early” expression on their faces. You may have to trust me on that one. Heading northeast from Martin’s Ferry brought me soon enough to the aptly named hamlet of Mt. Pleasant (population 478, salute!). It doesn’t look so pleasant from this particular shot but bear with me. As I drove through the tiny place I soon realized that this little community was full of some very old houses. Indeed, the places was founded in 1803, making it a pretty early Ohio settlement. 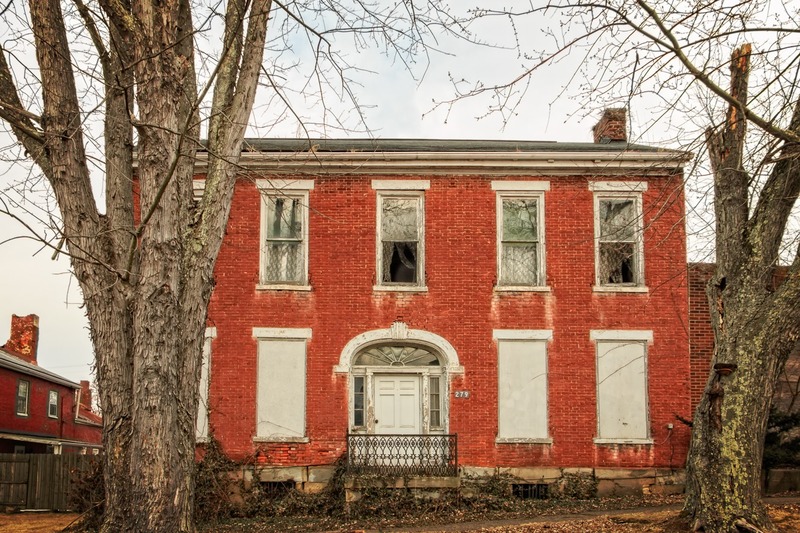 What is amazing, though, is how many of the very old houses from the early 19th century have survived the past couple of centuries and are still around today. 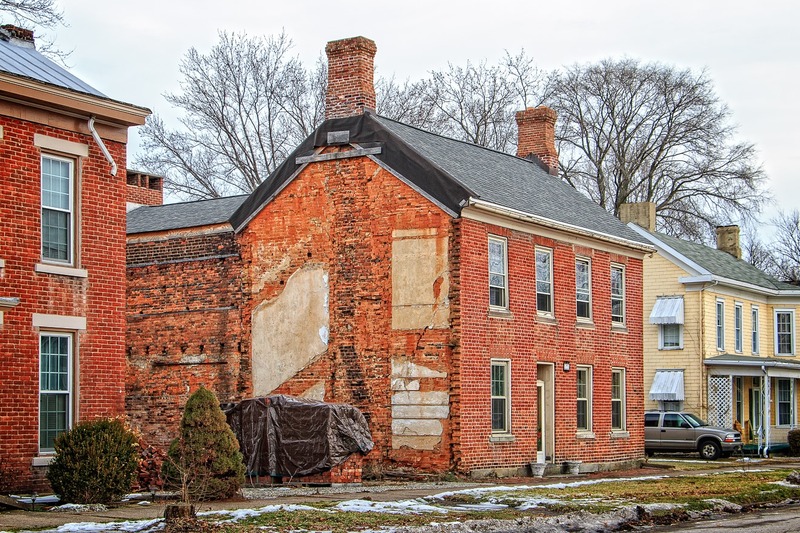 According to the National Park Service, one reason that so many old houses survived is that when the railroads came through Ohio in the mid-1800s, they bypassed Mt. Pleasant, making it a sort of eternal backwater. Here’s one of the first of these ancient houses I encountered. You can see how much of the brick-work has had to be re-done over the years. 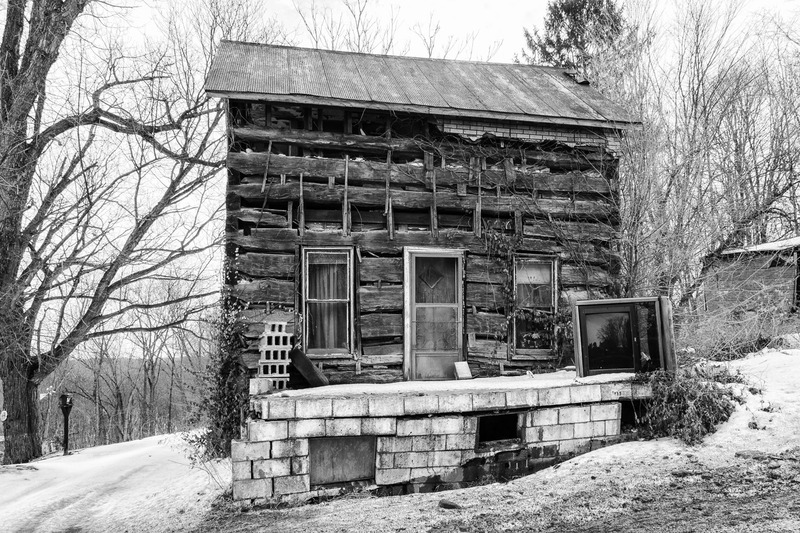 A little research revealed this to be the Lemuel Jones House, built around 1840 by Samuel Jones for his son Lemuel. The building directly to its left (your right) was a little shop building built by Samuel Jones; it has been a blacksmith shop, a shoe shop, and a bank, at different times. This three-story house was one of the most impressive of the 19th century buildings I encountered. Note the sign in front, announcing that this is Hogg Mansion. This was built around 1813, so it is more than 200 years old. This belonged to a British immigrant, John Hogg, who co-owned a pork-packing business, sending barrels of pork to distant markets. 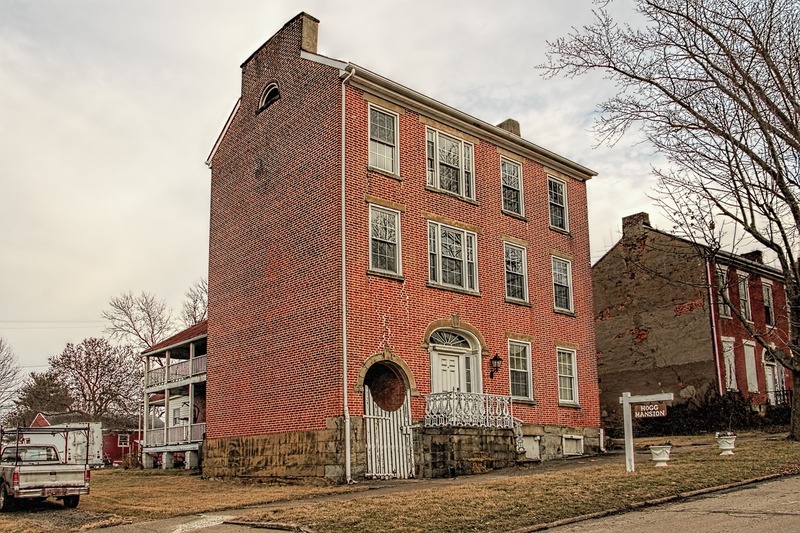 One historical description says that the arched passageway was to allow wagons to be driven through to the rear, but whoever wrote that must not have seen the actual house, because no wagon could fit through that. A lone horse, however, could. At one point, this was the second-most expensive house in the village. 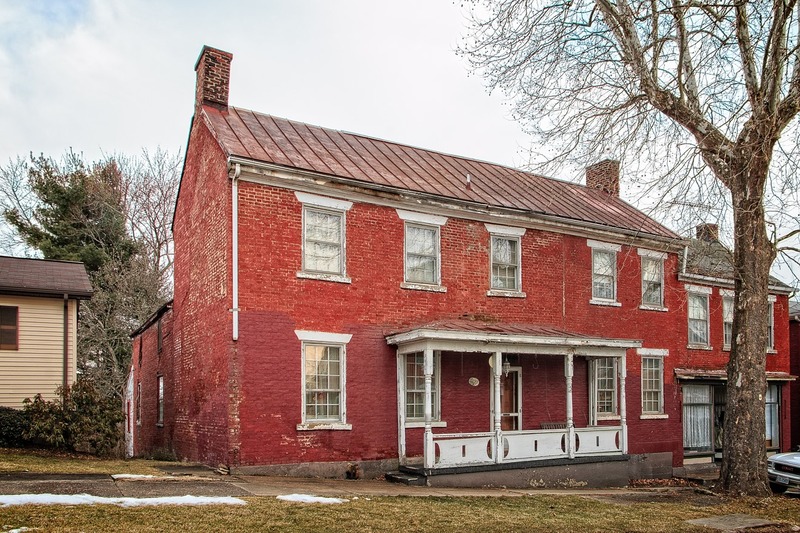 Just up the street a bit is the Amos Jones House, also built in 1813, during the War of 1812 (during which many in this little community made a fair amount of money supplying the U.S. Army and Ohio militia with provisions and equipment). This is also a pretty impressive house. A number of lots are missing their original houses; here we see a gap between two houses that once contained a third. Some houses were lost to fire, others simply to the ravages of time. Of course, some were torn down for more modern residences, too. The house pictured here was built sometime around 1814-1816. It is nice to see, by the tarped-over stack of bricks, that work is being done on the house to keep it in good shape. I wonder if they will brick over the entire side of the house. On the road between Mt. 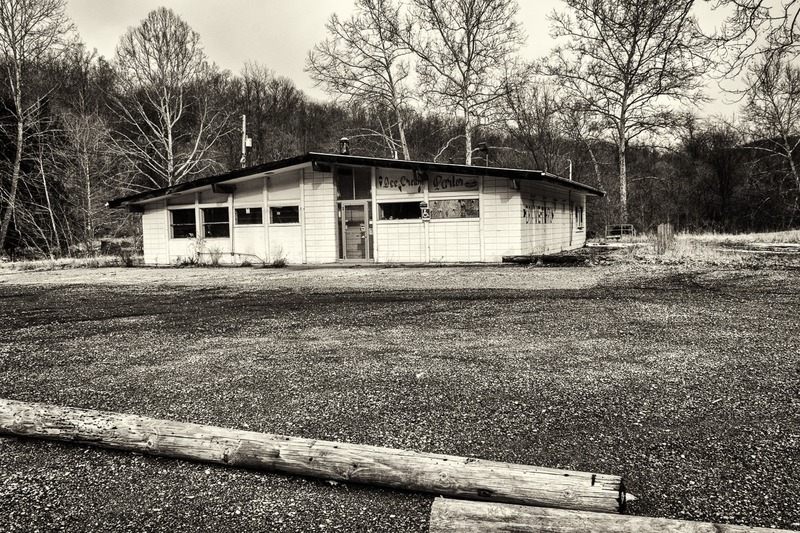 Pleasant and Dillonvale, I found this abandoned business, an old ice-cream parlor. The size of the building makes me think that it was something else before it sold frozen treats. Dillonvale is the next hamlet down the road from Mt. Pleasant. The railroad came through Dillonvale, not Mt. Pleasant, which may be why Dillonvale is a bit larger today (population 665, salute!). Sadly, Dillonvale is only a shadow of its former self—its population peaked in 1940 with 1,652, so today it only has a third of the population it once did. Its population has been dropping steadily for nearly 80 years now. Oddly, Ohio has a second community also named Dillonvale, all the way on the other end of the state, near Cincinnati. 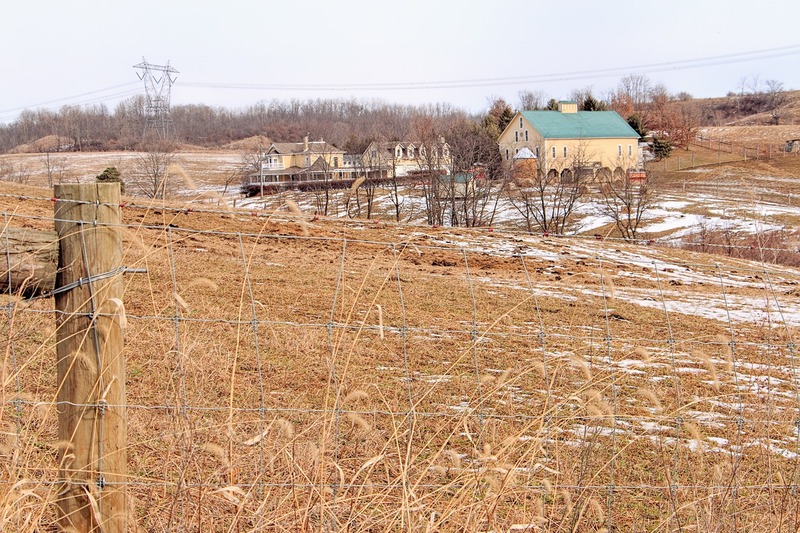 There used to be a fair amount of coal mining in this area, about a century ago, but that dried up in the early decades of the 20th century, so I am guessing that is the main reason for the town’s population decline. 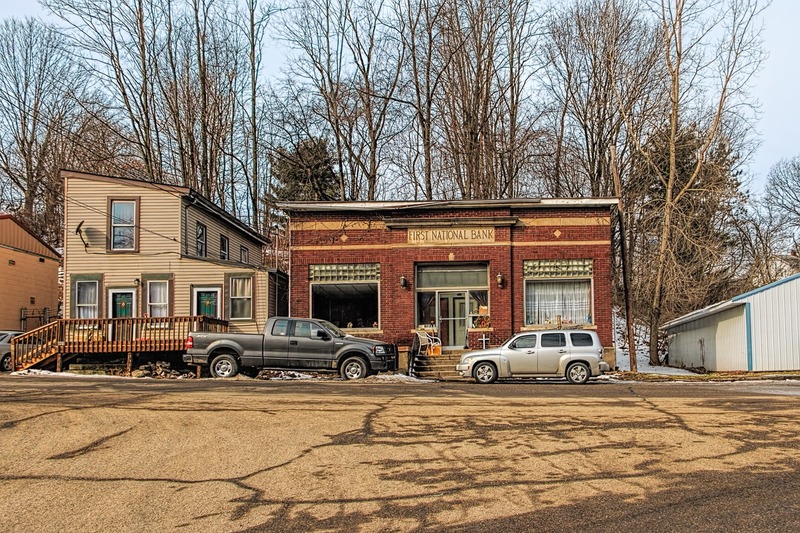 You can tell this is an aging little town by the fact that the two establishment you see here are the Fraternal Order of Eagles, a fraternal lodge, and the American Legion, a veteran’s lodge. 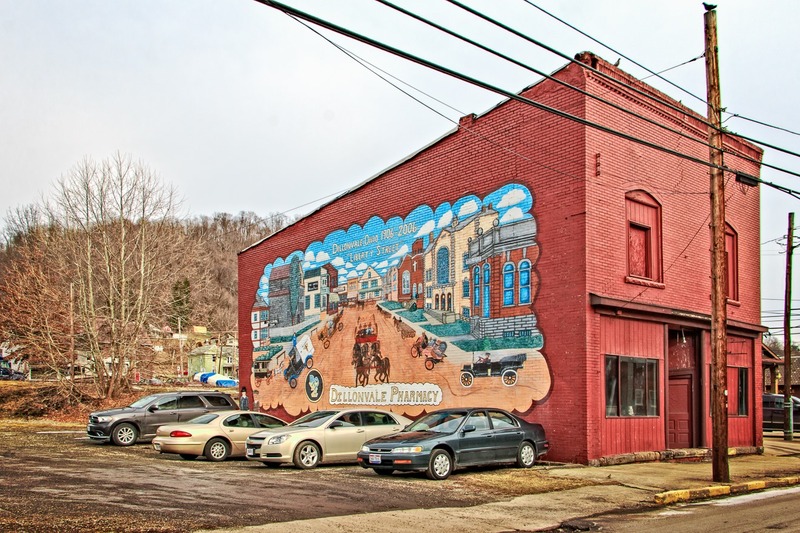 But every town, village or hamlet in Ohio has got to have its mural, and Dillonvale is no exception, This mural, seemingly drawn and painted by children, shows Liberty Street as it ostensibly was in 1906—if it did ever resemble the depiction in this mural, it indeed was definitely more prosperous once upon a time than now. Mt. 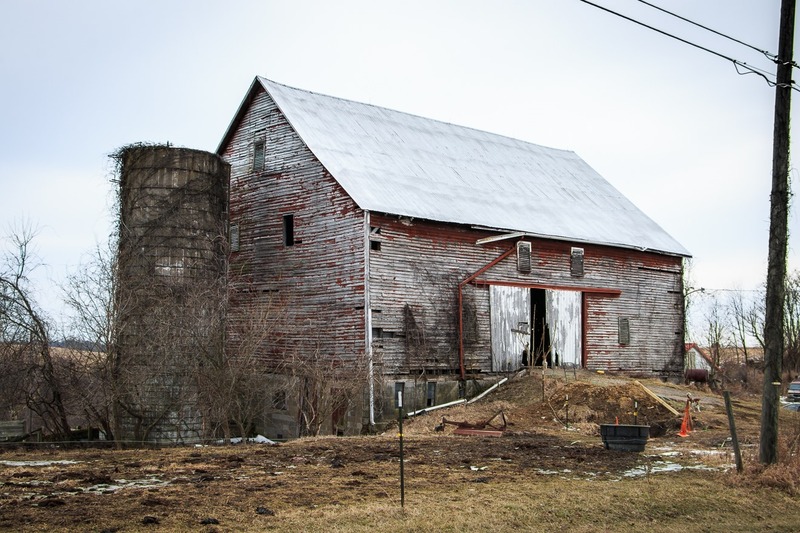 Pleasant and Dillonvale are only a mile or two west of the Ohio River and so too is this barn in the countryside north of them. 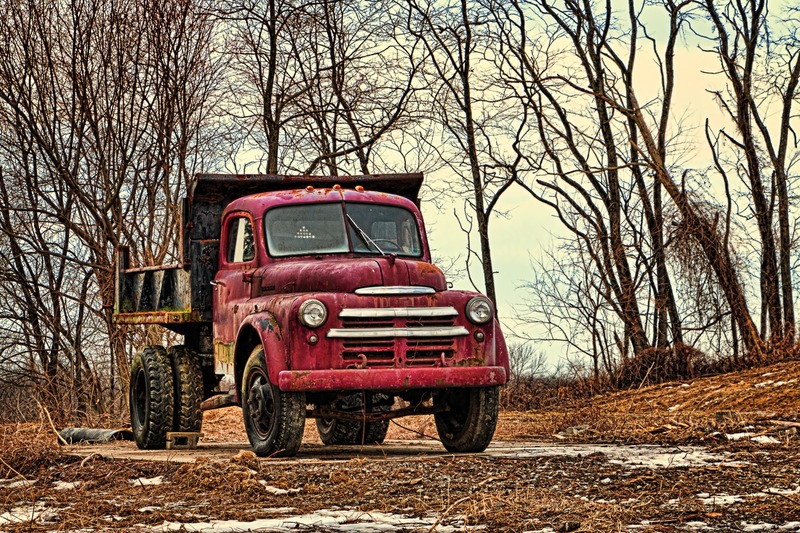 Near the barn were a lot of old trucks, including this one, which I thought had aged very impressively. I really am a sucker for old vehicles—have been since I was around four years old, though I have never been a gearhead. What I want is a full-time mechanic who can keep cool old cars running for me. It would also be someone my butler could talk to on slow days. He couldn’t talk to my vivacious personal assistant, because her thick Swedish accent is too difficult for his aging British ears. Now where did I put that Powerball ticket? My winding journey north-ish soon took me into the village of Smithfield, population 869 (salute!). 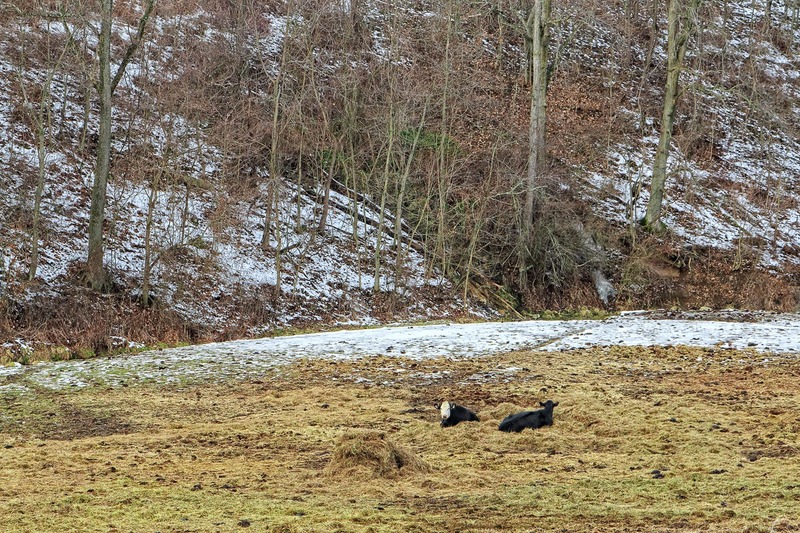 This is another one of those old Ohio settlements, having been founded in 1803. Smithfield reached a maximum population of 1,312 in 1960, but this did not last. 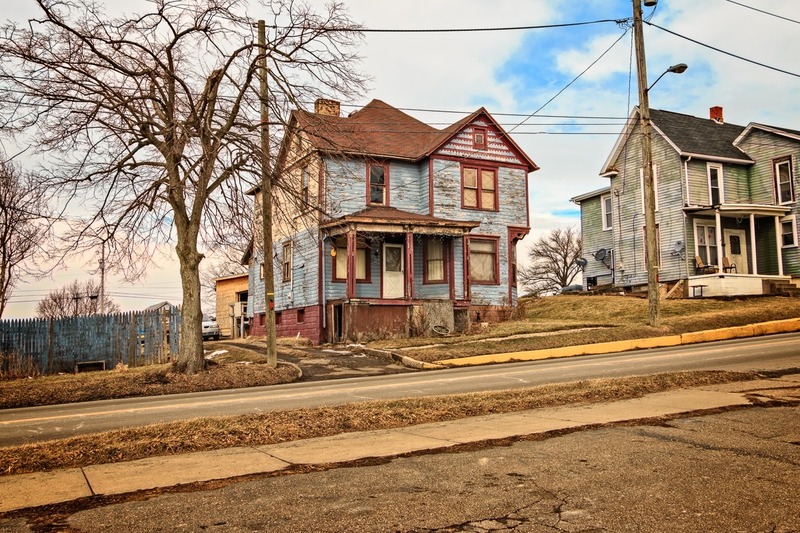 In fact, between 1980 and 1990, Smithfield lost nearly 45% of its entire population, dropping from 1,308 in the 1980 census to only 722 by the 1990 census. That is basically a bubonic-plague level of population drop. Surely something major happened in Smithfield during that time span, like a major employer going away. That is one of the steepest population drops I’ve seen since I began going on my Unearthed Ohio excursions and doing basic research on the places I visited. Here is a house that, like Smithfield itself, has seen better times. 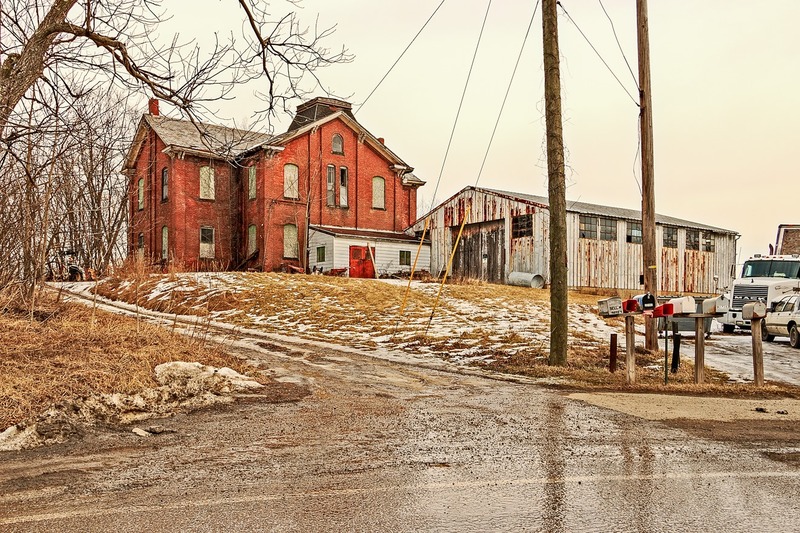 To the west of Smithfield is Hopedale, Ohio, a parvenu compared to some of the older places we’ve seen—Hopedale only popped up in 1849. Its population today is 950 (salute!). Like Smithfield, Hopedale has had a weird population history—but in the other direction. In 1990, its population was only 685, but by the 2000 census it had leapt all the way to 984, a 43.6% increase. 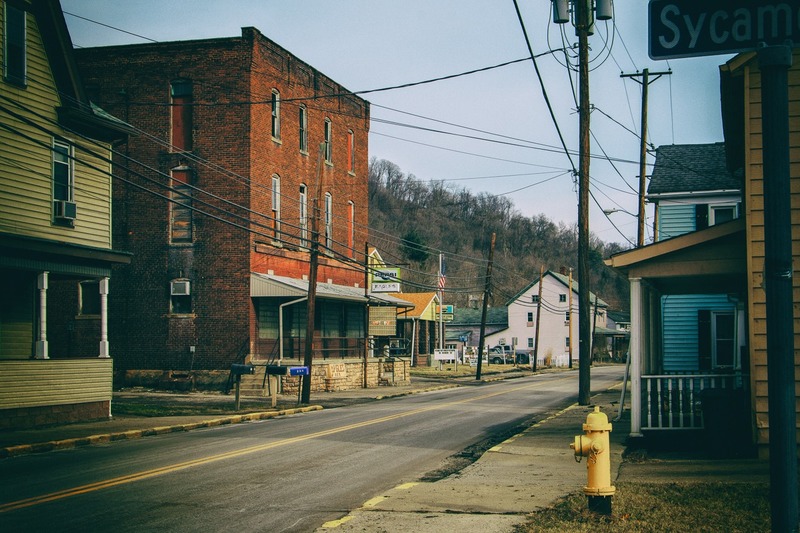 It is as if all the people who left Hopedale wandered in the Appalachian wilderness for 10 years then wound up in Hopedale. I find it very puzzling. Here we see what was at one point the First National Bank of Hopedale. This bank opened in 1903. As a national bank, it had the ability to print U.S. currency, which seems rather odd today. By the 1990s, it had become a branch of Heritage Bank and moved to a different building. In 1922, a group of five men burst into this bank to rob it, shooting the cashier, George R. Whittaker, in the neck—apparently fatally. However, the young Jessie Snyder, the bank’s assistant cashier, screamed, alerting the people of the town to the armed robbery. The men fled in an automobile and were pursued by a posse of four cars of armed Hopedalians. The local sheriff led three more cars in pursuit. However, the bank robbers abandoned their vehicle and fled into the woods, leaving behind only the thumb of one of the robbers, who got it caught in the car door and perhaps cut it off in order to make his getaway. The startling incident made the newspapers from coast to coast. I was unable to determine if they ever tracked down the culprits. You are looking down at a massive farm building complex. Actually, the photo really doesn’t do it justice. There’s what appears to be a mansion, a huge garage, a gargantuan barn, and a really large swimming pool. I thought it might be some sort of retreat center or resort, but could not find any indication of it being a business, as opposed to a farm. It may simply be that someone very rich lives here. 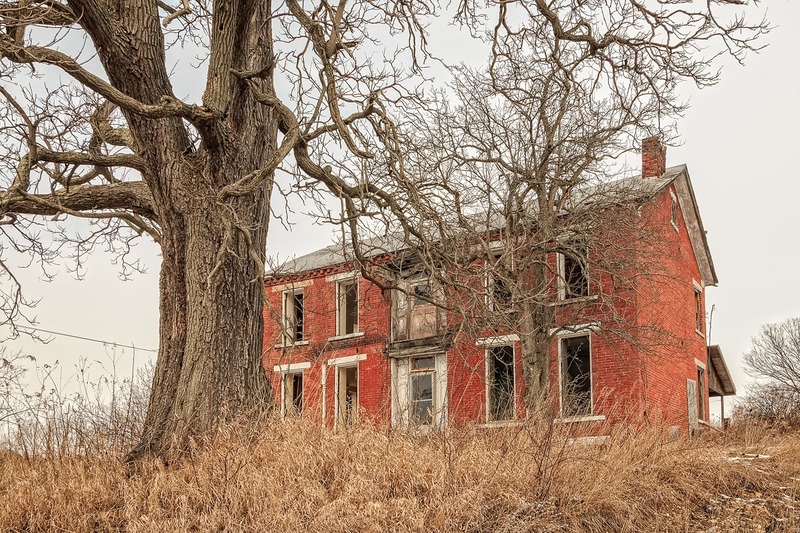 Just down the road from Fancy Pants Farm is an abandoned property with this ruined house on it. In the back, there seems to be some fire damage, so it may have been a fire that finally did for this dwelling. 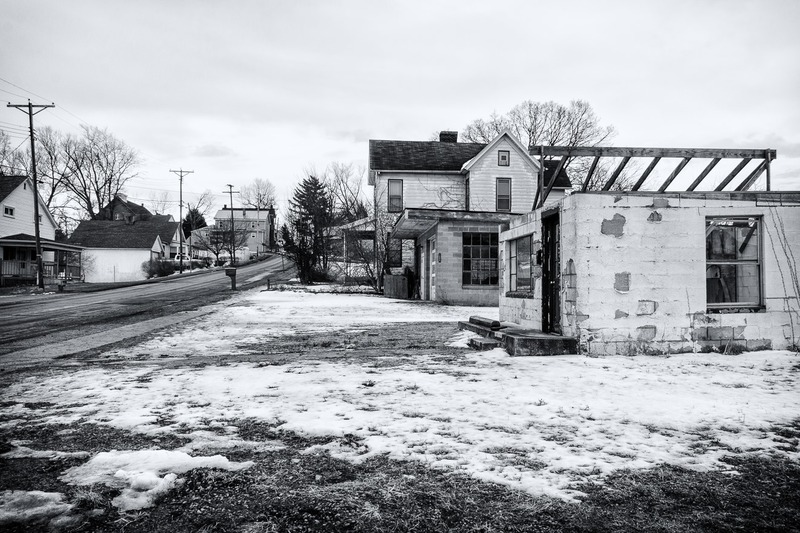 Around the bend is the tiny unincorporated hamlet of Germano, Ohio, population whoever can hear you when you holler. The odd name of Germano may be accounted for by the fact that it is located in German Township in Harrison County. If you have a burning desire to see German, Ohio—and, let’s face, it, who doesn’t, you can do so from the comfort of your own home, because someone took a video while driving through the place on a motorcycle and in 59 seconds you can pretty much see what it has to offer. Check it out—BostonBonnie will be happy for the views. This dwelling, I am happy to say, is not typical of the happy houses of Germano. BostonBonnie almost, but not quite, turns her head to the left to give us a glimpse of this once-imposing structure, one of the two largest buildings in Germano. I knew that it had to be either a former school or a former church, and it turned out to be the former former. This was once the German Township School, built in 1894 and closed in 1979. It allegedly cost $3,000 to build. 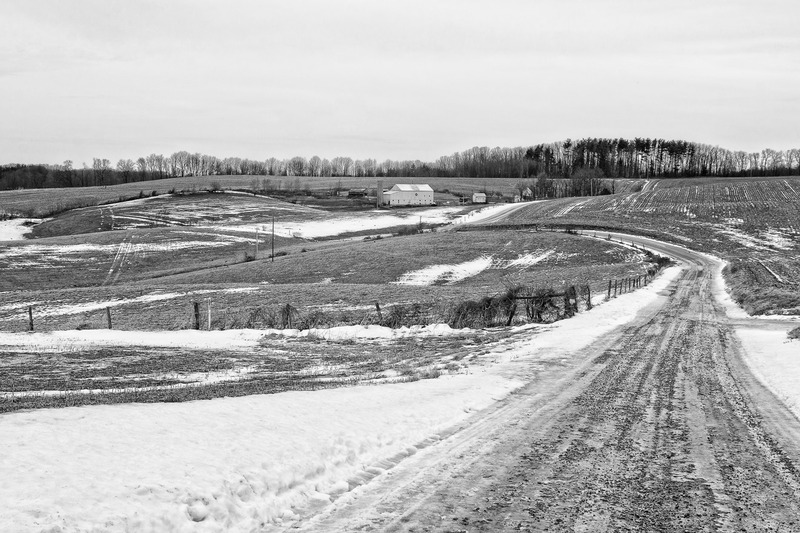 Here’s a look down an icy, icy gravel road onto some frigid farmland. And with this glimpse of the eastern Ohio landscape—a relatively flat portion of it—we will end this half of the excursion. Tune in tomorrow—or whenever I get around to posting the second half of this journey. Pat yourself on the back if you made it all the way to the end! I was delighted to see my grandparents’ former house in your photograph of Dillonvale (just to the right of the American Legion lodge). Thank you very much for sharing this. I appreciate all that you have unearthed.